The biggest food and lifestyle festival is coming to Joburg! There is no other prominent food and lifestyle festival that celebrates the heritage, diversity and culinary flair of Johannesburg like FLAVOURS OF THE CITY do. This one-of-a-kind festival can be enjoyed by the whole family, making it one of the must-attend food festivals of the year! From culinary delights inspired by all corners of the globe to musical performances, lifestyle exhibitions and more, FLAVOURS OF THE CITY is a feast-for-the-senses, showcasing the best of the region’s cosmopolitan personality and culture through food, drink and entertainment. Festival-goers will meander through a sensory village with areas dedicated to different food-cultures, indulging in the excitement of the flavours that “city living” has to offer including Jozi’s most delectable and interesting dishes, cocktails, craft beers, gins and more – topped off with a mix of zesty Jozi entertainment. Every corner will have something new to discover. Sip on authentic Cuban mojitos or try a sake Japanese cocktail at the Take 5 feature stand. Discover the flavour of the Caribbean with Jerk Chicken or sample some of Argentina’s most popular tastes. Belt your tastebuds for delectable foods from the Caribbean, Ethiopia, India, Japan, America, Italy, Mexico, France, and more! FLAVOURS OF THE CITY is a ‘trip around the world’ food tour in one Jozi hotspot – Montecasino. Friday Evening: Popular South African entertainer, Garth Taylor will kick us off with a mix of popular sounds from around the world. Later in the evening, the vibe will transform into an Afro-Latin vibe with a DJ playing sounds inspired by Cuba, Angola and Africa. Visitors must be prepared to get their dancing shoes on as Baila Afrika will be doing an Afro-Latin Dancing session where everyone is invited to dance Kizomba, Salsa and more. Saturday: Lay back in the afternoon sun and chill out to another set by Garth Taylor. The evening session will be headlined by Swing City, the popular trio featuring Nathan Ro, Graeme Watkins and Lloyd Cele. Sunday: Topping off the Sunday afternoon entertainment line-up is none other than the 2017 Idols South Africa winner, Paxton Fielies. Paxton is flying in especially for this event for a special 30-minute guest appearance. One of the key features of the festival, is the Culinary Studio, proudly sponsored by Lamb and Mutton SA and Stella Artois. The Culinary Studio will feature our celebrity chefs cooking meals from around the world. Anyone can join these sessions to get a face to face experience with the chefs doing what they do best. 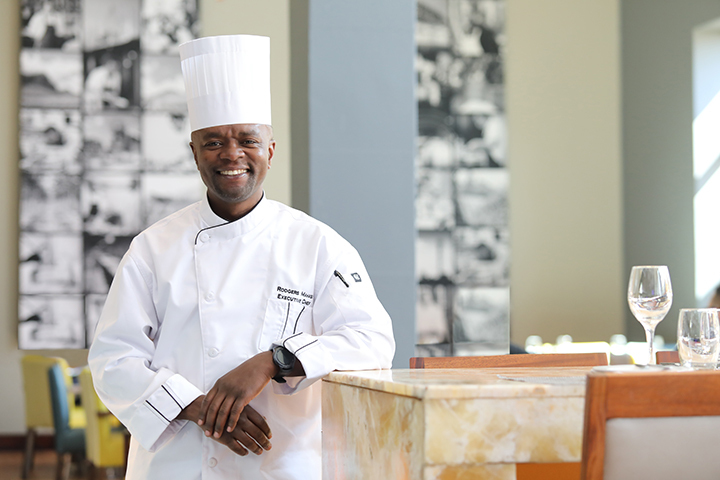 Celebrity Chef Lentswe Bhengu will be in studio cooking up an African-inspired dish and courtesy of Tsogo Sun, Chef Blake Anderson will be working his culinary magic in studio too.